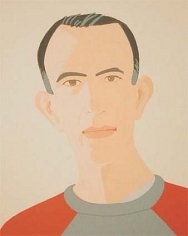 Alex Katz (1927) is an American born artist renowned for his figurative paintings, which examine the nature of representing the three-dimensional world on canvas in simplified portraits and landscapes. Katz was born in Brooklyn; he attended the Cooper Union School of Art in New York, and then studied art at the Skowhegan School of Painting and Sculpture in Skowhegan, ME. Amidst the height of Abstract Expressionism in the United States, Katz painted representational works, but in the 1950s, his quick, expressive brushstrokes represented the influence of artists such as Jackson Pollock and Willem de Kooning on his work. In the late 1950s and early 1960s, his adherence to simplified forms and to careful studies of light, flatness, and color are particularly evident in his work. 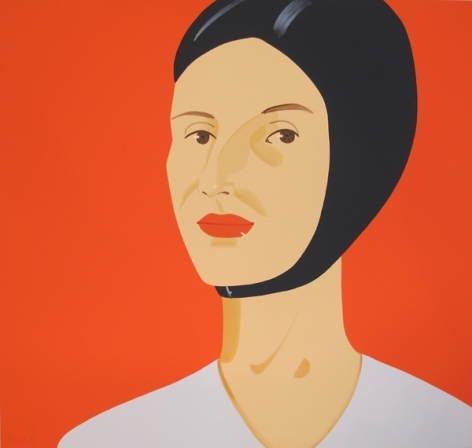 His allegiance to figuration and his embrace of the two-dimensional surface prefigured these features in Pop Art in the 1960s. Katz also worked with collage, printmaking, and set design, increasingly concentrating on these media and developing freestanding sculptural collages through the 1970s. He later painted large-scale landscapes, developing “environments” in his works intended to envelop and immerse the viewer, and continues working with natural themes in his works today. Katz has held solo exhibitions at the Irish Museum of Modern Art in Dublin, at the Jewish Museum, the Brooklyn Museum, and the Whitney Museum of American Art in New York, and at the Centro de Arte Contemporáneo de Málaga in Spain, among other venues, and has received several honors for his work, including a Guggenheim Fellowship and a membership in the American Academy of Arts and Letters. He currently lives and works in New York and Maine.